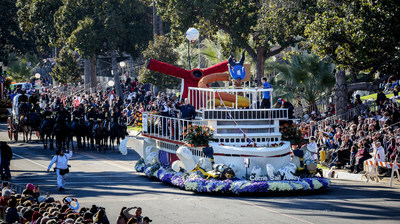 PASADENA, Calif., Jan. 1, 2019 /PRNewswire/ -- Building upon its distinction as the leader in West Coast cruising and celebrating the arrival of the new Long Beach-based Carnival Panorama later this year, Carnival Cruise Line kicked off 2019 in grand style with its first-ever float in the world-famous Rose Parade in Pasadena, Calif. Modeled after the new 133,500-ton Vista-class ship, the float cruised down the five-mile parade route this morning delighting the crowd of 700,000 who jammed along with the float riders to a Carnival nine-piece band playing "Uptown Funk" and "I've Got a Feeling" as well as the estimated 80 million television viewers watching at home. Aptly named "Come Sail Away," the colorful, highly detailed 55-foot-long ship-shaped float featured floral-inspired reproductions of signature Carnival features like the iconic red and blue funnel, a water park and fun-filled Lido Deck party, and the line's newest attraction -- the first-ever trampoline park at sea, in partnership with Sky Zone with jumpers on a working trampoline built into the front portion of the float. The float also included a replica of the Carnival AirShip flying overhead, just like the blimp that will embark on a month-long tour of California to promote Carnival's continued expansion in Long Beach, as well as new cruise itineraries from San Diego and San Francisco. Decorated with flowers, seeds and plants from 100-plus countries representing the global array of nations that Carnival employees hail from, the floral masterpiece also featured a BlueIguana and RedFrog from their namesake watering holes, with scuba divers at the water line blowing actual bubbles as the float sailed down the parade route. The "Come Sail Away" float was a favorite throughout the week of media coverage leading up to the parade. Dozens of broadcast segments featured the float's trampoline, the unique cruise ship details, the Rose Parade Queen christening the ship in a maritime-themed naming ceremony, and former Miss USA Deshauna Barber, who served in the U.S. Army and was the featured guest on the float in a salute to members of the armed services. In conjunction with West Coast debut of the Carnival AirShip, consumers can enter a sweepstakes at www.carnival.com/choosefun for a chance to win a free cruise as well as other prizes each week during the month of January. Additionally, for anyone who takes a picture of the AirShip and posts it on social media with the hashtag #ChooseFun, Carnival will make a $2 donation to its longtime charity partner St. Jude Children's Research Hospital® up to a maximum donation of $20,000. Designed by Carnival's in-house creative team and Fiesta Parade Floats, construction of the maritime marvel began in mid-November and encompassed 10 designers collectively working hundreds of hours right up until parade time. Dozens of volunteers, including Carnival travel agent partners, joined the designers to decorate the float. On Jan. 2, "Come Sail Away" will be seen close-up by more than 200,000 spectators who attend the traditional post-parade viewing party in downtown Pasadena with the Carnival AirShip flying over the city, as well. "We're the number one cruise line from the West Coast and what better way to celebrate this distinction and the arrival of Carnival Panorama than by our first-ever Rose Parade which truly captures the essence of what Choosing Fun on a Carnival cruise is all about," said Christine Duffy, president of Carnival Cruise Line. Carnival Panorama is set to debut with a special three-day cruise from Long Beach on Dec. 11, 2019, followed by the launch of year-round, seven-day Mexican Riviera service on Dec. 14, 2019. The ship joins Carnival Imagination and Carnival Inspiration to carry upwards of 600,000 guests annually from the West Coast – more than any other cruise operator. Journalists also can visit Carnival's media site, carnival-news.com or follow the line's PR department on Twitter at twitter.com/CarnivalPR. Carnival Cruise Line, part of Carnival Corporation & plc (NYSE/LSE: CCL; NYSE: CUK), is "The World's Most Popular Cruise Line®" with 26 ships operating three- to 24-day voyages to The Bahamas, Caribbean, Mexican Riviera, Alaska, Hawaii, Canada, New England, Bermuda, Cuba, Europe, Australia, New Zealand, the Pacific Islands and Southeast Asia. The line currently has three new ships scheduled for delivery – Carnival Panorama™ in 2019, Mardi Gras in 2020 and an as-yet-unnamed ship in 2022.